You know when you buy a piece that you’re in love with but you’re not sure where you'd wear it? 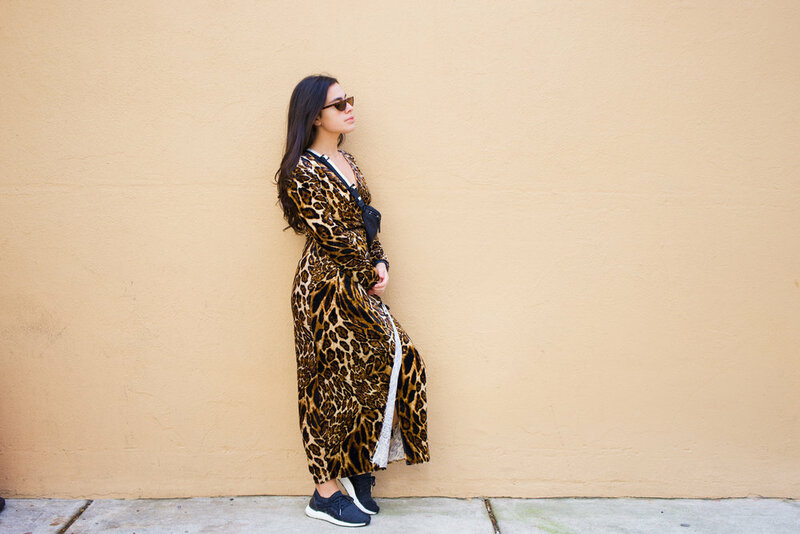 That happened to me with Wayf Leopard Print Dress, which I scored for more than 50% off! When it came in the mail I was so excited because I’d been dying for a statement leopard print piece for a while now. I just couldn't think of an event I would use it for. 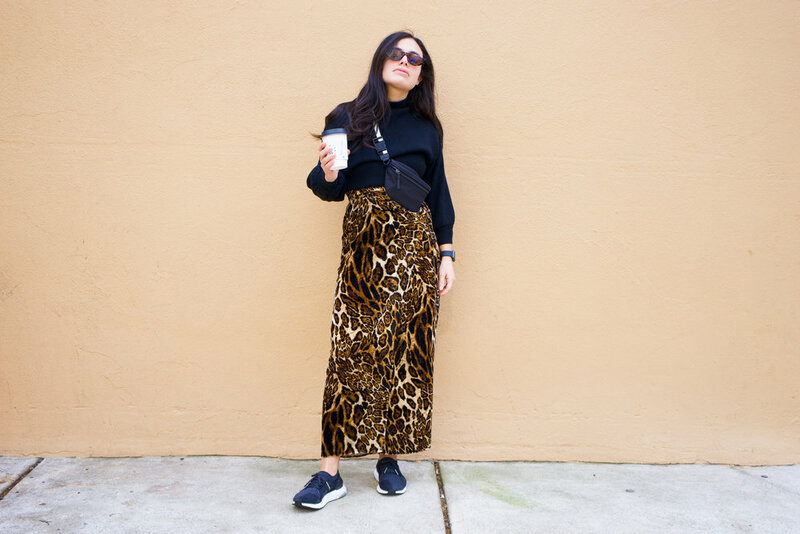 And one day, while it was just sitting in my closet, I thought to myself “I really have to get some use out of this thing.” So I dressed it down with some black casual wear — Adidas, a fanny pack, and a sweater. 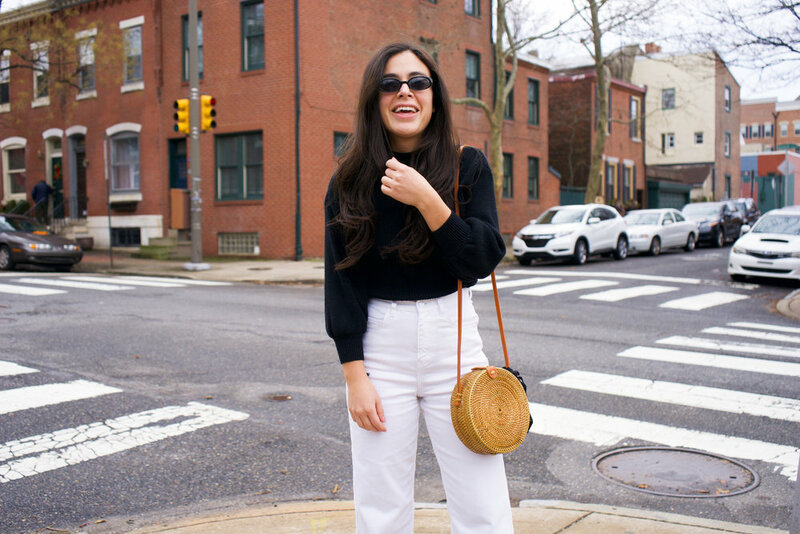 And while it may have been a bit too random/flashy of an outfit to be walking around the streets of Philadelphia on a random Saturday afternoon, I didn’t care because it was what I wanted to wear! Sometimes you just need to do you. So if there’s a dress in your closet that you love but have not worn yet, I challenge you to dress it down and get some use out of that bad boy. There are so many fun materials being used to create beautiful handbags in today’s world of fashion. Two of the most popular are the beaded and the rattan bag trends! The gorgeous black beauty featured above is the epitome of the beaded handbag trend. The glossy sheen and sophisticated boxy design certainly makes this an eye catching accessory. It effectively dresses up almost anything you pair it with. I wore it on NYE with white jeans and a black sweater, and the bag totally transformed the look. This Black Faux Pearl Tote Bag is a handmade piece from an Etsy shop called Ritzy. It was made with impeccable quality and with love by the shop owner Aanchal. For those reasons, it’s certainly worth the splurge. Treat yo self! The plant based handbag trend is alive and thriving! For those who are unfamiliar with rattan, it’s when thin pliable stems of palm are used to create artistic pieces like home decor and in this case handbags! My exact handbag is sold out but I found an identical round woven handbag on Amazon! Between the circular shape, woven palm pattern, and leather detailing, this bag is right on trend. And what’s even better is that it’s priced under $40 to boot! This New Year, I challenge you to add some texture to your wardrobe; get out of that leather handbag comfort zone and try one of these more unique materials! Christmas is one week away! And if you’re still struggling to find that something special for your someone special, then I’m here to help you out with this list of unique gift ideas. Give her something that was made by hand! 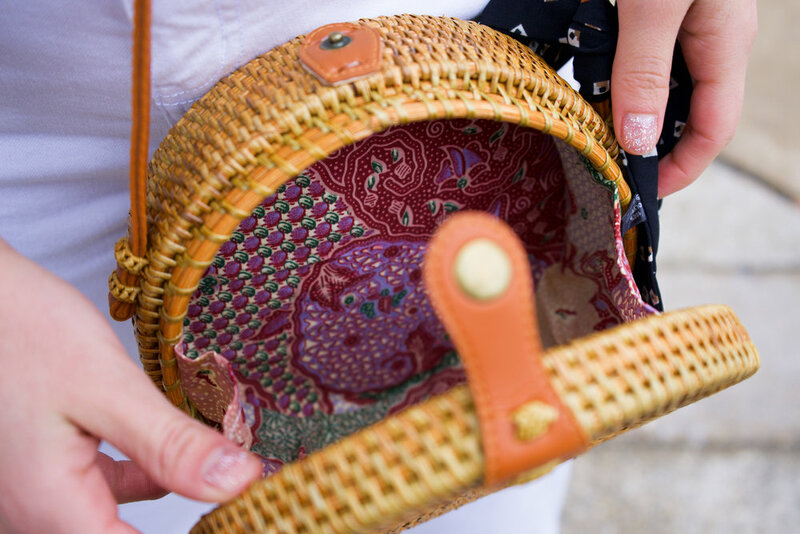 This beautiful Round Wicker Rattan Bag, by Papadaan, is only $22 and was made with love by local Indonesian artisans. I absolutely adore this bag and even though it looks a little summery, I’ve been using it throughout the winter with this little black scarf tied around it for contrast. I highly recommend this gift for any handbag lover out there. It’s made with quality and the fact that it’s handmade makes it unique. Do you have a fancy event planned for NYE together? Gift her something that she can use that night. Say for example, a pair of heels? These White Leather Heels by Forever Soles, are made with the highest quality, as they’re actually bridal shoes! Now, I’m not a bride but I do love using these shoes for other semi-formal events because the minimalist white design goes with almost every dress that I own. I'm usually a size 7 in heels and these heels are very true to size. Does the person you’re shopping for love Harry Potter? 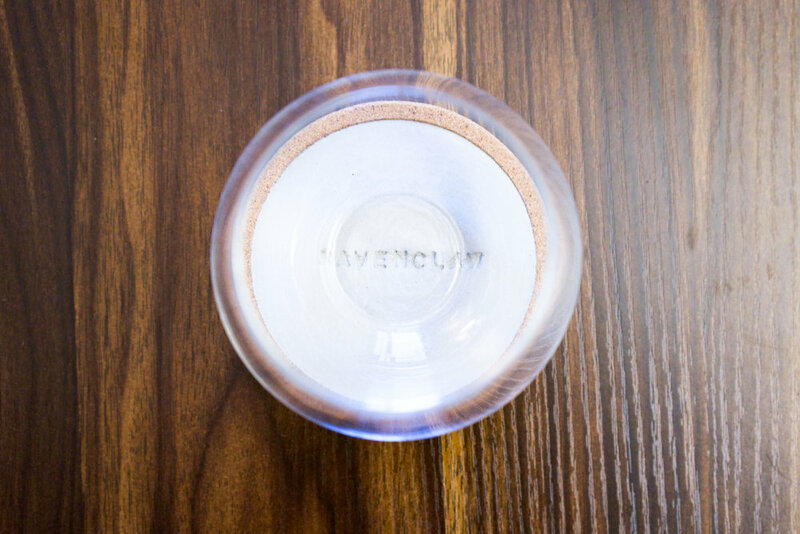 Then totally geek out with these Hogwarts-themed coasters! Concrete and Copper Co. makes these awesome concrete and cork coasters that are completely customizable. So if your person is not a fan of the wizarding world then you could go with just about anything else. These coasters are beautiful made and surprisingly light weight considering they are made of concrete. And they are only $26! They make the perfect gift! Is your gal a hardworking healthcare professional? If yes, then purchase her a set of the most comfortable and fashionable scrubs out there! Medelita is the place to shop for scrubs. Featured above is their Horizon Scrub Top, which features a flattering neckline, a countered waist, and four pockets. And as you can see, Medelita can customize your top with your name and a logo! I've paired the top with their Delta Scrub Pants. These bottoms have all the pockets you'd ever need -- two in the front with zippers, and another four angled pockets on the sides (perfect for your cell phone)! These are my all time favorite scrubs. In fact, I have another set coming in the mail soon! You can never go wrong with giving someone a candle! But be unique and give her a candle that has meaning behind it like these B.A.R.E Soaps candles featured above. B.A.R.E Soaps is an American bath and body company that uses their proceeds to help support a soap recycling workshop in India. They pay women fair wages to recycle used hotel soap to be redistributed to slum children. Their products both candles and soaps are all natural and 100% American made using sustainable sources, including rainforest-alliance-certified palm oil. For a full review on their soap products visit this older BTFL blog post. If you’re looking for a romantic gift, consider gifting her a sensual fragrance. Take for example the Bella Blanca scent by Oscar de la Renta. It’s like taking a breath of fresh air while floating on a white rose petal cloud. Featured above is the 3.4 oz bottle found at Macy’s. You can also find the smaller 1 oz bottle at Ulta! Does your man have an Apple Watch? If so, he needs a Casetify band. Casetify is my favorite apple-watch-band company because they offer an enormous variety of quality bands. And now, they’re offering a customizable one! That means you can choose 1-3 colors and have it monogramed. This gives you complete freedom to tailor the accessory to match his personal style! I hope that this list helps in gift shopping for your loved ones this holiday season! HAPPY SHOPPING! Last week Bill and I had ourselves a romantic lunch-date at White Dog Cafe, in University City Philadelphia. This is a very popular spot in U City. While we waited for our seats, it was clear that the White Dog staff was accustomed and prepared for the hustle and bustle. If you’re visiting or if you’re from the area and have not yet tried this adorable restaurant I highly recommend you make the time. I’ve detailed our whole experience below in a comprehensive review for you. 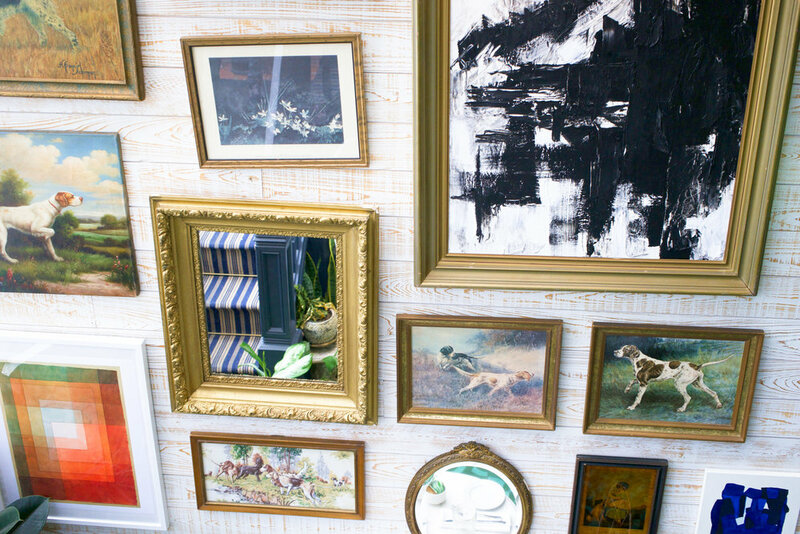 White dog has so many fabulously decorated rooms! 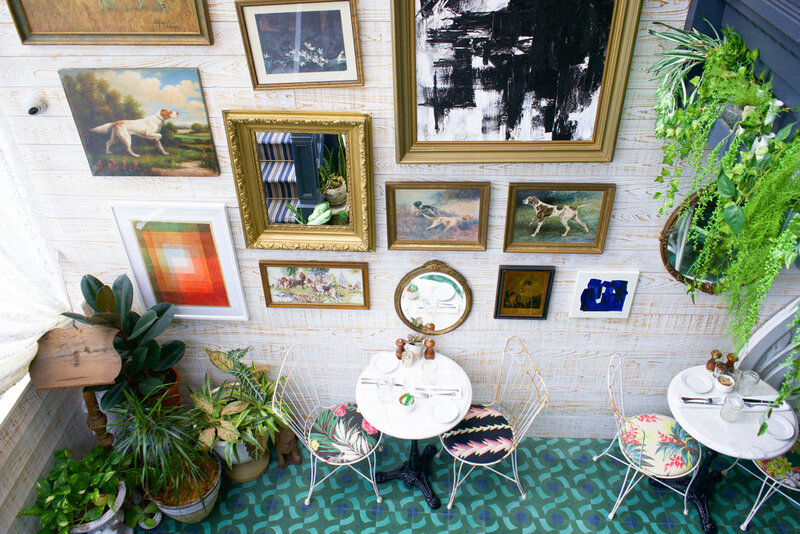 But the latest of their renovations is their Solarium, which is where we were seated. 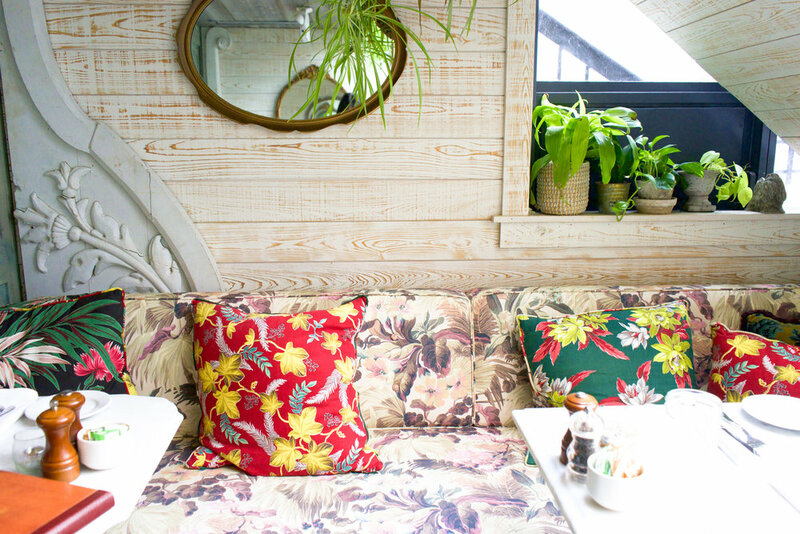 Between the bright colors, the playful patterns, and all the beautiful plants, I was ready to re-model my whole apartment to match. They even had a fun swing seat! I must have rambled on to Bill about how much I loved the decor for a good 20 minutes. We started off our White Dog experience with two signature cocktails. I ordered the “Go See A Man About A Grog” which was a mix of sailor jerry spiced rum, laird’s applejack, apple cider, rainwater madeira, chai, maple, lime, and ginger ale. It was tall glass of sweet autumn air. I highly recommend it for anyone who enjoys a light and sweet cocktail. Bill ordered the Bacon Pugkin which featured bacon infused knob creek rye, pumpkin, date nectar bitter truth allspice dram, angostura. Like mine, this drink also embodied the fall season but had a thicker consistence and stronger flavor. We ended up sharing both like we always do! While we waited for our food the waiter brought out an assortment of cake compliments of the chef: one pumpkin, one almond, and one chocolate chip, but all delicious! However, they didn’t hold a candle to what came next. The Harvest Squash Bisque and the Yellowfin Tuna Tartare were two of the best dishes I’ve had in a very long time! 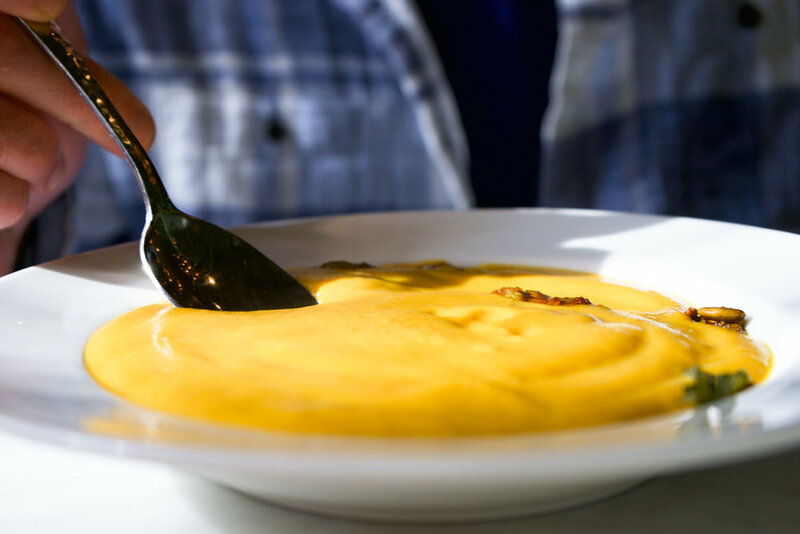 This warm bisque, which featured spiced pumpkin seeds, was both sweet and savory. It was a creamy bowl of heaven! Speaking of creamy, the tartare came topped with a heap of deliciously smooth guacamole. Meanwhile, the fresh taste of the yellowfin was complimented by the sweet sesame soy glaze. We will definitely be heading back to White Dog so that we can indulge in these two dishes again. And lastly, we couldn’t leave without dessert! So we shared the Singing Dog Vanilla Bean Crème Brûlée and the Cinnamon Brioche Bread Pudding. 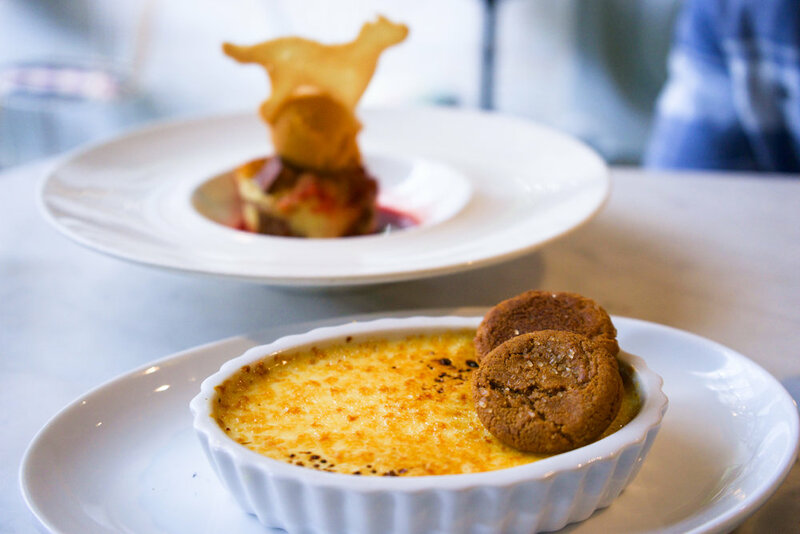 The brûlée, which is one of our favorite desserts to order wherever we go, was topped with some tasty molasses cookies and did not disappoint! Meanwhile, the bread pudding was topped with pumpkin sorbet and cranberry orange sauce. The main pudding was baked to perfection; it was moist but cohesive. And the best part was the pumpkin sorbet because it added remarkable flavor. Suffice it to say, we thoroughly enjoyed our time at White Dog Cafe and look forward to dinning there again. For more photos and videos of our experience, feel free to flip through the Instagram “FOOD” Highlight I posted from that day! HAPPY THANKSGIVING FOLKS! It’s that time of the year again and the Black Friday Sales have already started. I’ve rounded up the best sales that are going on right now and even included suggestions for some of them! I’ll be updating this as the week goes on so stay tuned! I own the Classic Petite Melrose watch (featured in the photo above with the Classic Cuff Rose Gold bracelet) and I absolutely love it! If you’re looking for a dainty fashion-forward time piece, Daniel Wellington has a crazy good selection. Now until November 26th, score a free strap with the purchase of any watch. Meanwhile, their Dapper Collection is 50% off and these select sets are an extra 20% off. Plus, use my code BESTTRENDS for an additional 15% any of the above deals. Last year I did some damage to my bank account with this sale! There are so many trendy products for under $20 that it’s a bit overwhelming. So I’ve gathered a few of my favorites and I’m linking them below! Okay so if I could afford to buy every single Dagne Dover handbag style, I so would! I own the Classic Tote and Petite Tote already but I have my eyes on the Andra Crossbody next. Dagne Dover bags are made with impeccable quality and feature sleek minimalist designs! This is definitely one of my favorite handbag brands. Nasty Gal is always right on track with all the popular trends! They’ve got some great snake and leopard print items, both of which are hot prints in the fashion industry at the moment. Shop my favorites below and remember.. the entire website is 60% off! 6 out of 10 of my pairs of jeans are Levi’s and they are hands down my favorite. Levi’s makes quality denim affordable, and even more so now that everything is 40% off. I do suggest trying on in-store first because I’ve found that my size varies greatly depending on the style. J.Crew always has the most classic styles! And rarely do full price items go on such a steep sale. Right now get 40% off your entire purchase. Linking up the cutest stuff right here! My all time favorite Apple Watch band is the Simply White band by Casetify! It’s comfortable, high-quality, and the white is stunning. For a full review and more photos of it styled, visit my post HOW TO MAKE SCRUBS STYLISH. Right now, Casetify is offering 20% off $25+, 25% off $65+, and 30% off $100+! If you’re a health care professional looking for some new scrubs, look no further than Medelita! For a full review and photos of some of their scrubs, visit my HOW TO MAKE SCRUBS STYLISH blog post. For Cyber Week, Medelita is offering 30% off your purchase!